Clean rice and cook it with 2 ½ cups of water. When the rice gets cooked, add the grated jaggery to it. Cook on low flame till the jaggery melts completely. 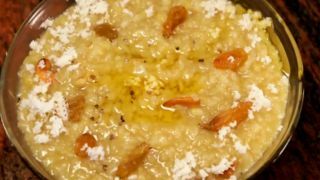 When the payasam gets thickened, add cardamom powder and grated coconut. To this add the sliced banana. Mix well. Do not burn the payasam. Remove from the flame. Add 2 tsp of ghee in a pan. Fry cashew nuts and raisins. Add this along with ghee to the payasam. This payasam is offered as “prasadam” (offering) in temples.